I was watching an episode of BBC quiz show Pointless this morning. You know the one - it's basically a poshed-up version of Family Fortunes, where the contestants try to guess the least popular answers to taxing questions like "What are the names of some Tom Cruise films?" The topic for the final round was Top 40 singles by Prince. The contestants were flummoxed. "I don't like Prince," complained a gurning cretin called Ciaran. "Nobody like Prince." In the end, he and his partner came up with three possible answers: Purple Rain, 1999 and Get In My Car. That last one, by the way, is by David Hasselhoff. Do you know who would have aced that round? 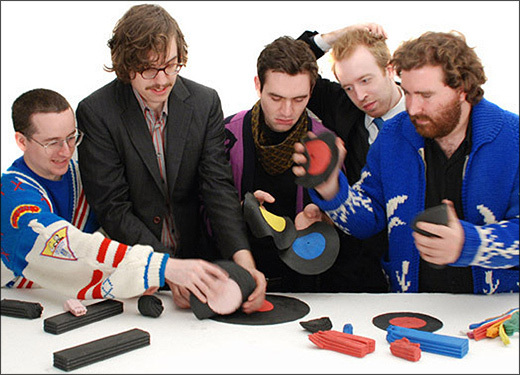 Hot Chip. They never stop banging on about Prince. In fact, there's even a Hot Chip album track called Down With Prince, featuring the immortal refrain: "Gettin' down with your royal badness". So Alexis and Joe and the rest would surely have guessed some of those pointless answers: Batdance, Anotherloverholenyohead, 7, Controversy. There were quite a few. Now, despite their rabid fandom, Hot Chip have never really captured the prowling sexuality of Prince's best work. But as they said in this Guardian interview, the point of inspiration isn't copying your idols, but being led by their example. So the band apply Prince's patented formula of sonic experimentation in a pop template, to come up with intriguingly twisted singles like Dark & Stormy, a wholly unexpected new single that pounced on the internet earlier this week. With the band currently pursuing a range of solo projects, it's not clear whether this is a one-off or the first volley from a new album. Either way, it's one of the best things they've done in ages. The single is out on iTunes now. Or, if you're achingly hip (and prepared to wait for a bit) you can pre-order it on 10" vinyl for 22nd July.